Hypertech HyperPAC Performance Automotive Computer - Lightning Motorsports - Selling Speed since 1996 ! Have your own Drag Strip timing clocks, Engine Dyno, Chassis Dyno, customizable Gauge Package, Diagnostics tool, and of course, the best high-performance engine tuning available. 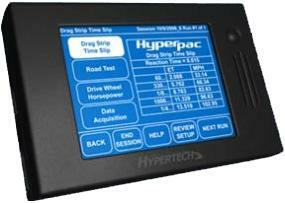 Performance Tuning provides all of the features of Hypertech’s Power Programmer, including powerful 50-State, street-legal Power Tuning available, plus many more adjustable features. A “Christmas Tree” start produces an exact duplication of a drag strip time slip: reaction times, 60 ft., 330 ft., 1/8-mile, 100 ft., and 1/4-mile speeds and e.t.’s, and displays a “magazine-type road test” in ten mile per hour increments. The Dynamometer program calculates horsepower and torque, at both the driving wheels and the engine with superior accuracy. Mount the HYPERpac in a convenient place, connect the cable to the vehicle’s diagnostic port under the dash, and press the “power on” button. Diagnostic port connector and sturdy suction cup mount included. The Gauge Program continuously displays important engine operating conditions as analog or digital gauges. The Diagnostics program reads, explains, and clears diagnostic trouble codes (DTC’s).